The Wendigo: Devourer of Mankind | Spell Hub. Brining the occult to life. Appearing in the legends of the Algonquian peoples of the Northern United States and Canada is the myth of a vicious creature with an insatiable appetite for human flesh. 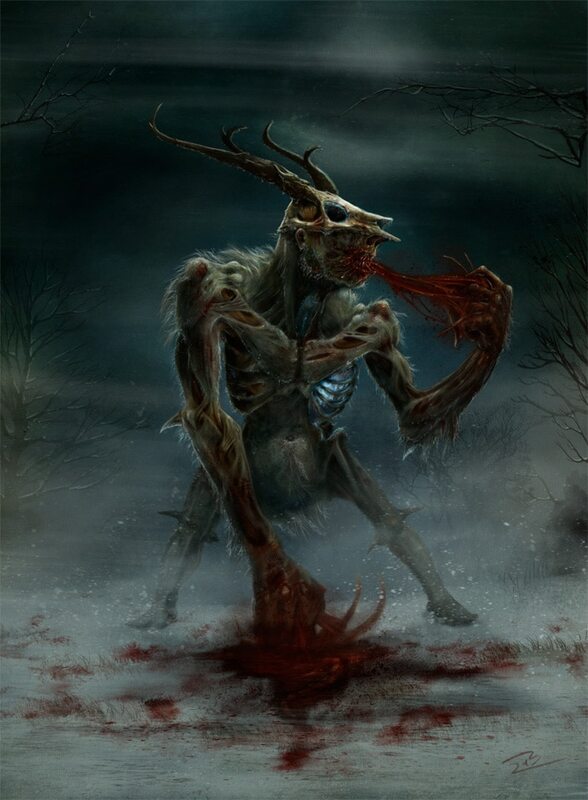 A Wendigo ( also called windigo, witiko, windiga, and several other variations) is believed by several native cultures to be both a demonic spirit capable of possessing humans (turning them into cannibals) or a monster that humans can become if they participate in cannibalism. These creatures are strongly associated with long, cold winters, famine, and starvation. There is some variation in the descriptions given to these malevolent, supernatural beasts, but they have been depicted by some as being around 12-15 feet in height, with a grayish complexion, and sunken eyes. Their bodies are severely emaciated, with bones being clearly visible, and they possess long, sharp teeth and claws. They are also said to give off the distinct odor of decaying flesh. Wendigos are said to be skilled hunters, who possess extreme speed and strength. They are known to be personifications of greed and gluttony, and cannot be satisfied by killing and consuming one person. Driven by hunger, they must constantly seek out new victims. In some tales, they even capture and store away individuals for later consumption. According to legend, a person most in danger of becoming a Wendigo is someone who has indulged in the taboo practice of cannibalism, even if it was only as a last resort. Due to the isolation of these tribes and the harsh northern winters, the risk of facing starvation was a genuine threat. However, in that situation, suicide was considered to be a more acceptable act than consuming human flesh in order to survive. Many scholars believe that the Wendigo myth was created to discourage cannibalism, even in the most extreme circumstances. The legend of the Wendigo is also linked to a phenomenon known as “Wendigo psychosis”. This controversial culture-bound syndrome is characterized by the belief that one is transforming into a Wendigo, accompanied by an ever-increasing desire to consume human flesh (although other sources of food are often available). The most well-known case of someone suffering from this powerful delusion was that of an Alberta trapper named Swift Runner. After losing his eldest son in the winter of 1878, Swift Runner murdered and ate his wife and five other children. He was subsequently executed by authorities. In some aboriginal communities, it was believed that the Wendigo psychosis was instances of people literally becoming Wendigos. An Oji-Cree chief named Jack Fiddler became well known for his ability to defeat Wendigos. When he was arrested for murder in 1907, he readily admitted to killing individuals suffering from Wendigo psychosis. He stated that he believed he was protecting the community. Fiddler committed suicide in prison before he could be convicted. Interestingly, reported cases of Wendigo psychosis began to drop off in the 20th century as the Algonquian people became more familiar with and accustomed to Western ideology, and their communities became less rural. In the 1980s, debates between psychologists and anthropologists began over the historicity of the phenomenon. Some researchers pointed to several credible eyewitness accounts as proof that the psychosis was an actual occurrence while others dismissed the whole thing as an elaborate fabrication. Today, despite the fact that the Wendigo psychosis seems to have disappeared, stories and sightings of the infamous creature still pop up from time to time. Additionally, versions of the Wendigo are still used to insight fear in horror films, literature, and television. For me, this particular monster tale of mythology is one of the most intriguing because it not only appeals to our common fear of monsters but also to the fear that we all have of becoming a monster, too.